They look like small, striped horses, don't they? 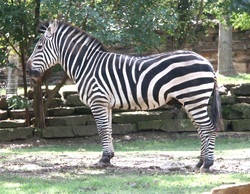 Just like a horse, the zebra spends most of their time eating grass with their teeth. 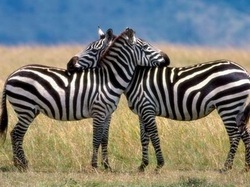 their stripes to confuse their predators. When a lion sees lots of zebras running around together, it may look like one big zebra to them! Theircolor protects them! Have you ever touched a zebra? If you have, you know their covering is smooth. 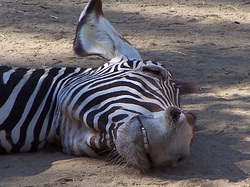 Zebras eat all day and sleep all night.